If you have an email account, you've almost certainly received an e-mail from a Nigerian scammer promising to pay you thousands or even millions of dollars if only you’ll loan them some money until funds in some locked up account are freed. It’s been going on for years, with the latest variant involving a Nigerian astronaut supposedly trapped in space for 14 years! In the 14-years since he has been on the [space] station, he has accumulated flight pay and interest amounting to almost $15,000,000 American Dollars. This is held in a trust at the Lagos National Savings and Trust Association. If we can obtain access to this money, we can place a down payment with the Russian Space Authorities for a Soyuz return flight to bring him back to Earth. I am told this will cost $3,000,000 American Dollars. In order to access his trust fund we need your assistance [read: money]. Now, who would believe this silly story? Not many, it turns out. So why are these scams so crudely written? Are the scammers really that unsophisticated? Quite the opposite, according to Microsoft. “Far-fetched tales of West African riches strike most as comical. Our analysis suggests that is an advantage to the attacker, not a disadvantage. Since his attack has a low density of victims the Nigerian scammer has an over-riding need to reduce false positives (people who don’t fall for it). By sending an email that repels all but the most gullible the scammer gets the most promising marks to self-select, and tilts the true to false positive ratio in his favor,” writes Microsoft researcher Cormac Herley, in a report. 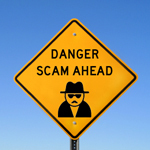 The thing is, pulling off a scam necessitates an investment in time and resources for the scammer. “For example, each respondent to a Nigerian 419 email requires a large amount of interaction, as does the Facebook ‘stuck in London scam,’” Herley says. That’s why scammers come right out and tell people they’re from Nigeria—doing so weeds out suspicious types who aren’t likely to cooperate. To make scammers' lives more difficult (and for general amusement), some people counter these crooks by "scambaiting"—wasting the scammer's time by pretending to be a gullible victim. My husband had a brief stint as a scambaiter with a bad guy on Craigslist, who was supposedly selling an expensive SUV for a fraction of its value and promised to ship the vehicle as soon as my husband wired him the money. My husband was able to waste hours of the guy’s time before the scammer finally gave up. While my husband amused himself by baiting a scammer, it’s not something you should do unless you're very careful (not to mention it’s a waste of your time, as well!). "The golden rule is: Do not give out any real information whatsoever," a scambaiter named Mike Berry told NPR. "The scammer who's writing you may live 3,000 miles away, but he may have friends who live near you, and these are not people you want to mess with." Since these "please send money" scams keep changing their stories, just make sure you don't fall for one of them. If you get a "get rich quick" email from a stranger (or friend, for that matter) that sounds too good to be true, it almost certainly is. Wish I Could Be a Scambaiter, Too! Ordinarily, I send scam emails straight to dust. The one I couldn’t resist threatened to lock up my accounts unless I could prove I wasn’t dead. I emailed back that I was, indeed, dead so they could take it from there. Although I find these emails decreasing (kinda like the Black Plague or the Spanish flu dying out after the vulnerable population had all been hit), I appreciated this thoughtful and discerning analysis. Wonder what they’ll think up next! UPS COURIER DELIVERY COMPANY !!! Heres just a couple I received today, but my question is how do we stop them from filling up our spam? Lol -I sometimes have important mail go to spam, so I have to pay attention to it as well. There is no “Unsubscribe” and how do they get our email addresses? Also how do they get away with using “well known companies” such as PayPal, UPS and many others? People should also beware if they are sent a check and they try to deposit it, they can be brought up on fraud charges as well. I do ship and keep record online, so UPS is one I have to open and look at. Its so annoying! A while ago I had recevied a letter confirming my application to be a Mystery Shopper. In the letter was a check for $3850.00. The check looked real. My husband wanted to cash it in the worst way. And he even got mad at me because I said it was a scam. How do you know it’s a scam? Well first of all, I never signed up to be a Mystery Shopper. And then I told him that the letter was from New York. The call back number was in Canada and the check was from a bank in Texas. When my husband still wanted to cash the check I called the bank in Texas and asked them about the account. They said the account had been closed for several years. I told that to my husband and he said that would have been a lot of money to pay back. Yes it would have. I just wish Nigerians were not this notorious on the NET. But then that is wishful thinking. The most complicated scam was a company who sent pamplets to a school selling calendars, books, etc. My son wanted a calendar and I ordered it from a company in Canada. The next three months they took money out of my account such as 29.99, 49.99, 69.99 (I was told they use these amounts because they are not noticed as easily). They used different names on each amount and I thought my husband was ordering something. I went to the bank and filed against them. A investigation showed they would do this for about 3 months and chance names and banks. The company was processing orders in Canada but the bank they were using was in Jamaica! Bank had insured me, so sometime later I did receive my money but they told me the FBI and others were aware of this but have not been able to do anything about it. When the bank showed me the paperwork trail they followed I was amazed! I have had American Airlines tickets (enclosed in an attached Zip file), UPS, FedEx notices of laptops shipped to me, WalMart gift cards, etc etc. Of course they are a joke if you look closely, but I can see how easy it is to be taken in by them. One skill that is unfortunately being ignored in the educational system at all levels is “crap detecting.” That’s what gets some politicians elected. A much milder scam might be found in many people’s view of social media like Facebook. How different is that—people will willing expose a great deal of personal infomation in exchange for the ability to play some games and post even more personal information. I would offer that anytime we respond to something automatically without considering the outcomes and what’s at stake, we’ve perhaps been scammed. In some cases, we almost ask for it. I am amazed that this type of scam still works. I remember seeing these emails for the first time back in the late 90’s. It looked like a scam then too. The you meet people who have fallen into the trap. Amazing. I used to receive many emails indicating that a spouse has passed away leaving a fortune behind, with millions in the bank. They tell you that they’d like to share it with you but want your bank information and a sum of money upfront and the balance is yours. I simply reply that I work with the FBI in the internet fraud division and that their claims will be investigated with the utmost diligence and b, the email account is shutdown and they run for the hills . I have actually worked with law enforcement in the bunco division and can detect a scam immediately.